Featuring an indoor pool and a spa with Turkish bath and massage facilities, Tebriz Hotel Nakhchivan offers modern and elegant accommodation in the centre of Nakhchivan. The property also has a fitness centre and a sun terrace. With free Wi-Fi and satellite TV, the air-conditioned rooms include a minibar, an electric kettle, free coffee, a seating area and a private bathroom with free toiletries and hairdryer. You can enjoy lake and mountain views from the rooms. Guests can enjoy a rich breakfast every morning. There is also a bar and a restaurant on site. 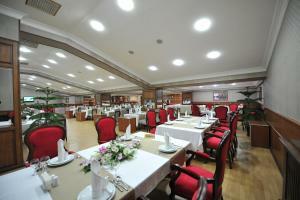 Hotel Tebriz Nakhchivan is 7 km from Nakhchivan Airport, while Lake Aras Dam is a 15-minute drive away.